Whether you are shopping for silver jewelry or a piece of antique silver, it is important to determine the authenticity of a solid silver item from a silver-plated one. 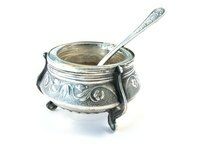 Solid silver pieces from Europe, Russia and America are typically imprinted with a mark, verifying their authenticity. When it comes to silver jewelry, many jewelers will use an acid test to distinguish a piece of solid silver jewelry from a silver-plated piece. Purchase a silver acid test kit over the Internet for this purpose to use at home. You can also take the piece to a jeweler for an acid test. Look for an imprint mark on the bottom or side of your silver item. It may read any combination of “Sterling, 925/925/1000, 900, Coin, Standard, 9584, 800 or 84." An imprint like this indicates the piece is solid, sterling silver. Look for a blue-purple hue on a silver item. This indicates the item is silver plate and not solid silver, which will have a grayish-black hue. Check the piece for nicks. If the nick looks solid throughout and not another type of metal, this could indicate the piece is sold silver rather than silver plate. Use a silver acid test kit on your piece by making a small scratch on the underside with a needle. Put a drop of the acid on the scratch. Use the color chart in the kit to determine if your piece is solid or silver plated. Take your piece to a jeweler and ask him to do an acid test or have him melt the piece down and assayed to determine the content of silver. The piece will be destroyed during this process, however.